It started sixty years ago. 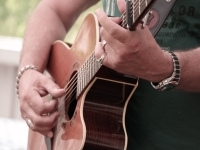 If music be the food of love….play on! Ljungbacka is a small and quaint farmlet below Ryssberget in southern Blekinge, close to Sölvesborg, to be precise Knubbasliden 45, Ebbalycke, Gammalstorp. I, Stefan Sigfalk – Sandberg, spent many years of a happy childhood on Ljungbacka which belonged to my mother’s parents Anton and Klara Sandberg. 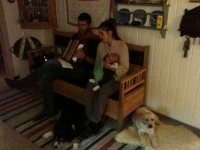 Anton and Klara had 10 children on Ljungbacka, 8 of which grew to reach adult age. Anton was a master on his Magdeburg accordion and my childhood’s midsummer nights with dancing around the decorated pole to granddad’s accordion music are a living memory to me. I became a musician myself later, moved abroad early and have spent most of my life playing folk music around Europe and New Zealand. When we were children, we built stages on Ljungbacka and performed various things that we had practised to the villagers who wanted to come. We took 25 öre gate money and those that stood on the small hill across the road and watched us over the fence didn’t have to pay. 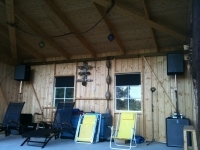 Those were two simply carpented stages that were built in our childhood’s summers over fifty years ago. 2010 I was given the opportunity to buy Ljungbacka back from a Danish family that had spent numerous years with softly renovating it back to its former glory. 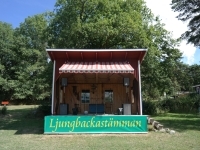 In the summer 2011, I spent three weeks building the third Ljungbacka stage together with three professional stage carpenters. Beautiful like a red traditional cottage with white corners and small paned sash windows it represents my childhood’s dream. 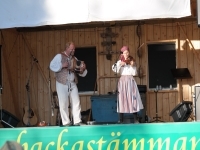 Under the big oak tree, Ljungbacka was going to get its very own folk music festival! 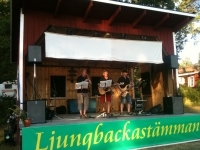 Then the very first Ljungbacka music day took place. 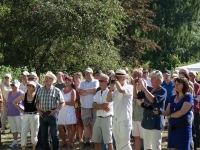 300 guests honoured us with their presence in Ebbalycke on this warmest day of summer. 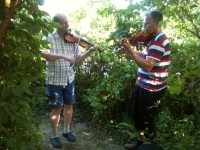 We had spontaneous sessions under the chestnut tree by the road and in the garden in front of the house. The house was also open for all musicians and listeners. The big stage offered great performances, both from booked groups and spontaneous musicians who wanted to perform on stage. This was the day for the second festival. 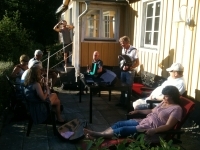 On stage we had Asa Jinder, riksspelman, Jonas Otter, Swedish champion in country, Anna Neah Deutgen, a treasured and prominent Swedish singer, Eoli, string quartett from Malmö conservatoire, the Skatelöv Folk-Fiddlers, the Sigfalk family and many others. We welcomed 400 visitors on this beautiful day! 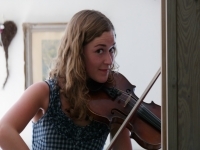 The third festival with, amongst others, CajsaStina Akerström, Elin-Louise & Gustav, Briggen Tre Bröder, Peo Hallberg and Irish Pitch was very successful with 600 visitors! We organised a further parking field and more toilets for 2016! The fourth festival. We didn't think that we could top the line-up of 2015 but we did....we had a great and well visited festival, again with top musicians. The highlights ofcourse Tim Collins and Gary Shannon from Ireland, they also led a late night session in front of the house that will never be forgotten! Michael Magnusson, Naomi, Fia & Gunnar, B.A.R.K., Bortanvind, Peo Hallberg and Kringel with Karin Nordberg all performed great music! The weather was perfect for the fourth time. The fifth festival, this year with a new carpented wooden dance floor in front of the stage. Ofcourse it was opened by a traditional dance group with traditional costumes, Asarums danslag. 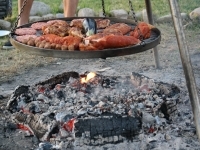 The sixth festival with Dönaberga band, all Swedish champions Nils Wiberg and the brothers Pär and Torbjörn Näsbom from Switzerland and the far north of Sweden. That year we introduced childrens dances on our hexagonal dance stage. Many other musicians contributed to yet another very enjoyable festival. 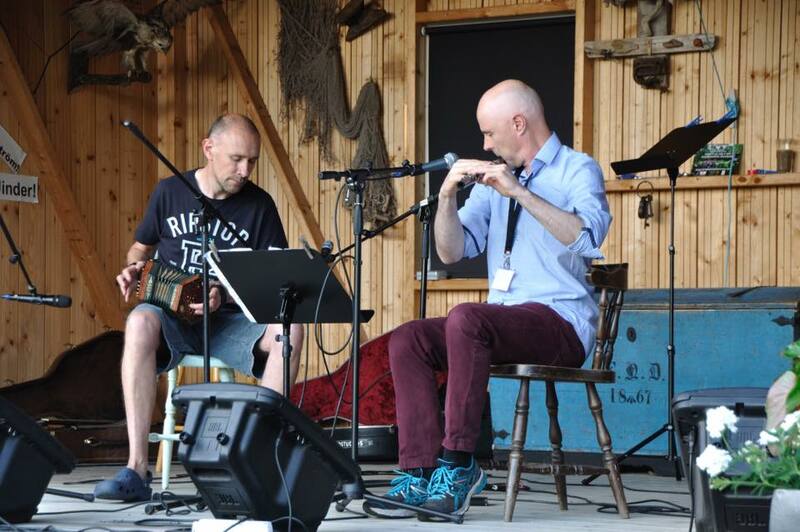 Irish Pitch finished the 2018 festival with a great concert of Irish traditional music and the newly erected musician's lounge proved to be very popular. The weather was so warm that we had less visitors than other years but our club ended up with a financial plus anyway. Now we're moving up to Sunday 21. July 2019. The seventh festival. With musicians like; Jenny Almsenius, who was awarded the Cornelis-prize for young songwriters 2018 and most definitely a rising star, the Näsbom brothers were so popular that they had to promise they'd come again this coming summer, we are all looking forward to that! Many more will be contributing to another great festival. 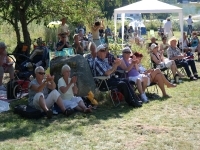 Ofcourse there will be dancing again on our open air dance stage and dancing for children. Briggen Tre Bröder will finish the programme this time. Check the programme page, it pays off! and all of us in "Ljungbacka's Friends"